My husband eager to have something new to eat for tea. The simple recipe,I could think of is popiah. It is easy and took less than an hour . The only drawback is, it is very oily. So, I need to drain the oil with kitchen tissue several times. 1. Boil the potato with the skin. After few minutes, boil mix vege together until soft. 2. Drain and peel off the potato skin and chop into small dice. 3. In a big bowl ,combine ingredient B, mix vege and potato. 4. Saute the mixture till cooked. 5. Stuff the mixture into popiah skin by using a spoon and roll it out . Apply water at the end to stick. 6.Repeat step 5 till finish. 7. 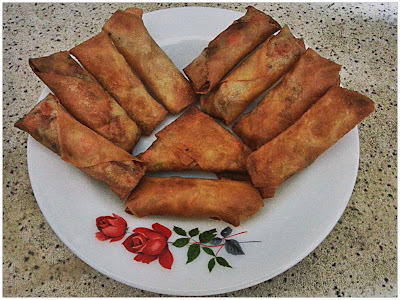 Deep fry the rolled popiah till it turn brownish. Place it on kitchen paper to drain out the oil.